A total solar eclipse is a cosmic coincidence with stunning visual effects for viewers on Earth. When the moon passes in front of the sun and blocks it completely, it casts a shadow onto our planet that plunges areas into a darkness that feels like nighttime in mid-day. What causes this extraordinary phenomenon? Several things need to occur at once to create a total solar eclipse. First, the moon needs to be exactly the right size to block the sun. Next, the sun, moon, and Earth need to line up in a straight line, or nearly so, with the moon between the sun and Earth. Finally, to see the full eclipse, you need to be standing in the correct spot on Earth. Lucky for us, our moon is the perfect size. When it passes in front of the sun, it exactly covers the sun’s central disk, while letting the corona shine out around it in a spectacular display. The two bodies aren’t really the same size, of course: the sun is 400 times the diameter of the moon. But it’s also 400 times farther away from us, and this relationship between size and distance makes the sun and the moon appear the same size. It’s a wonderful coincidence, and should not be taken for granted—Earth is the only planet in our solar system with a moon the proper size and distance to cause the striking solar eclipses we see. The motions of sun, moon, and Earth bring the three bodies into the correct alignment about once every 18 months. These are the times when eclipses can happen. As the daytime moon passes in front of the sun, it begins to cast a partial shadow (called the penumbra) onto Earth. 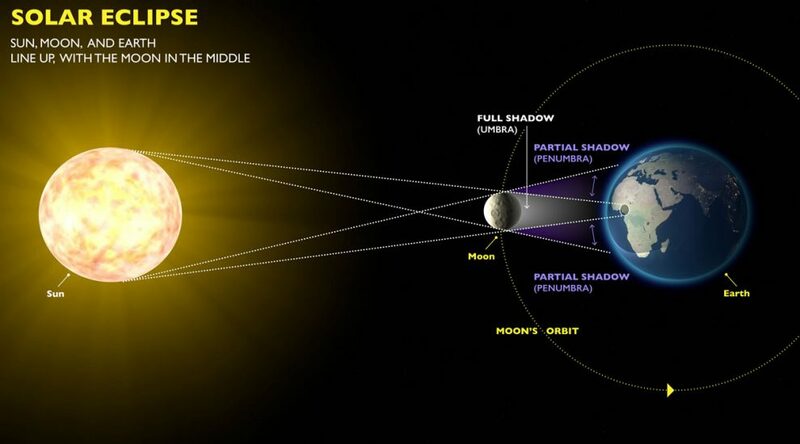 At the height of the eclipse, the sun’s light is entirely blocked, and the moon casts a full shadow called the umbra. The moon’s full shadow hits only a small part of our planet, however. The matched sizing of the sun and moon results in their perfect alignment being visible from only a limited region. The area from where you can see the total eclipse is never more than 167 miles wide, and is usually less. Outside that area you’ll see only a partial eclipse, or none at all. This area is not static, because the moon and Earth are not fixed objects: the moon orbits Earth and Earth orbits the sun, in addition to spinning on its axis. These motions continue during an eclipse, so the spot on Earth where the moon’s shadow falls traces a curved path across the planet. This is the path of totality, the only vantage from which you can witness the total eclipse. Although eclipses happen regularly, the path of totality is so extremely limited that very few people have ever seen a total solar eclipse. If you stood in one place and waited to see one, you could wait for 300 years or more. On August 21, 2017, a total solar eclipse will cross the United States, allowing millions of people to watch it in person.